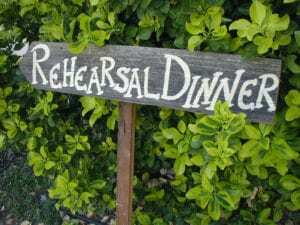 Wedding Rehearsals done easy in 5 simple steps! Your wedding rehearsal should be a quick, easy and simple process. If your ceremony venue doesn’t provide a coordinator, you should choose a friend or family member to assist with the coordination that isn’t a part of the wedding party. If you are having your ceremony in a house of worship, there will be a coordinator to assist with the rehearsal but you sould also have a point person that can guide the bridal party as well. Meet & Greet – confirm with the Bride & Groom that everyone has arrived and introduce yourself and what role you are playing on the wedding day. Explain the process by talking briefly about the steps listed below. Everybody 1 – 2 step –line up the wedding party, parents, bride, groom and officiant in the correct order for the processional then send everyone down the aisle. Be sure to time the bridal walking down the aisle correctly so photos can be taken and everyone gets their time to shine. The bride comes down the aisle on her father’s left arm if he is escorting her. When it’s time for her father to be seated, the bride will typically kiss him good-bye then shake the hand (or hug) the groom. The bride’s father will then walk behind the bride to his seat. At this point, the bride normally gives her bouquet to her maid of honor and the groom will extend his left hand to the bride. Standing at attention –Place the bridal party in their positions on the “altar” area so they know where to stand during the ceremony. Ceremony– After the processional is done and everyone is in place, you or the officiant will run through the basic ceremony sections. If there are readers, songs or poetry happening during the ceremony by a “special guest”, those should be rehearsed as well – special guests should be sitting in rows close to the front but on the ends. Who will have the rings on the wedding day. Let’s get the party started– After the kiss, the bride will get her bouquet from the maid of honor, be announced as Husband & Wife and the recession begins. Everyone proceeds down the aisle in reverse order as they proceeded. Again, timing is everything so be sure to practice that as well. Following these steps will ensure that everyone knows exactly what to do…Below is a helpful diagram of where everyone should be standing. And if worse comes to worse and this seems like too much…hire one of our fab wedding planners to assist!! !